There are several things I would like to write about at the moment: the Iron Age Crannogs of Perthshire, for example, and the importance of music in Christian worship. Life will keep getting in the way of writing! First things first, anyway: the Tuesday tree. Just a few observations of the delicate, coral-like tracery of the bare branches of a mature beech tree, under which I walked on a grey cold morning recently. 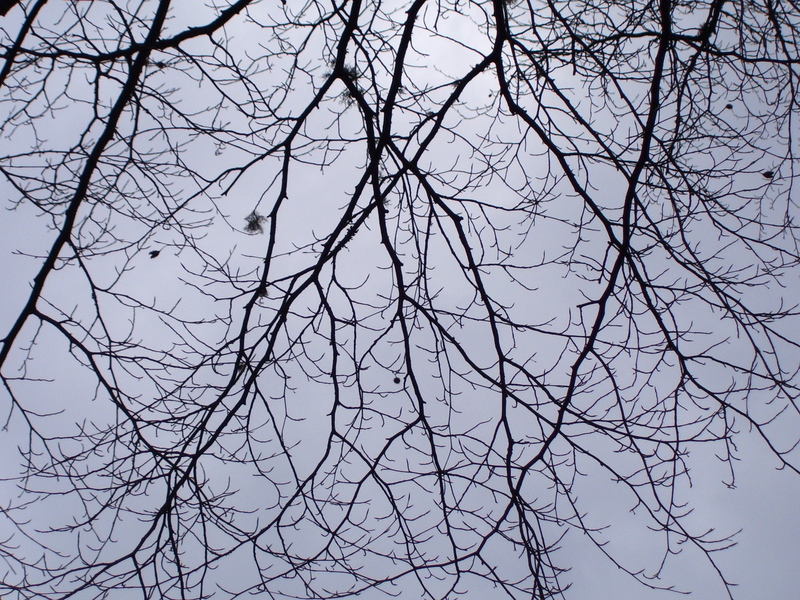 You can see some of the husks of last year’s nuts still clinging to the branches, like knots in the lace. I’ve decided to move to Scotland and do your estate-management duties so you can write about the Iron Age Crannogs of Perthshire. 🙂 In the meantime, your beautiful photos of the filigree-like branches are a lovely consolation. I must admit to wanting to help out too, to give you more time for your beautiful writing, DB. 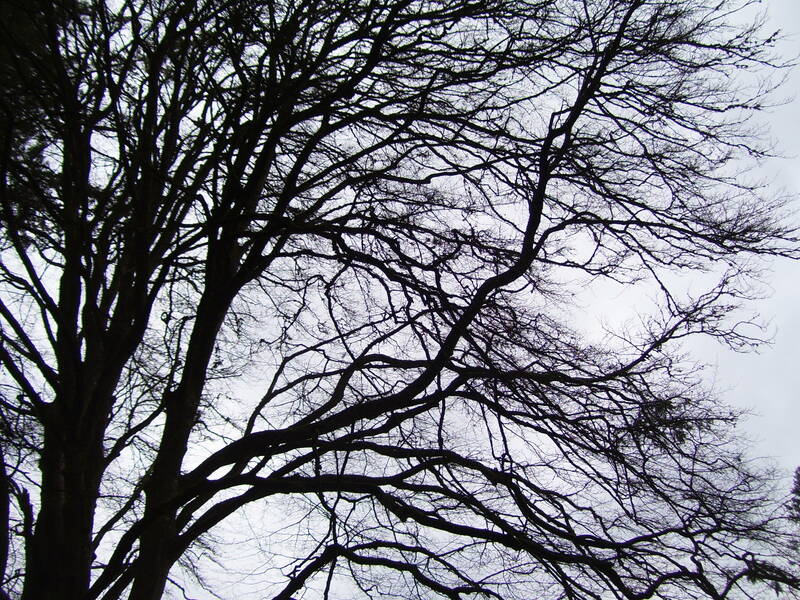 🙂 Thank you for the lovely photos which demonstrate so clearly why deciduous trees are my favourites. A different beauty in every season. Bet the tree branch sounds are amazing. Now that is a really interesting comment. Sound is absent from this blog, except in the occasional description: I rely so heavily on visual beauty. But you’re right: when it’s windy (as it has been this week) the branches squeak and moan, while the wind in the Douglas firs sounds like the sea. 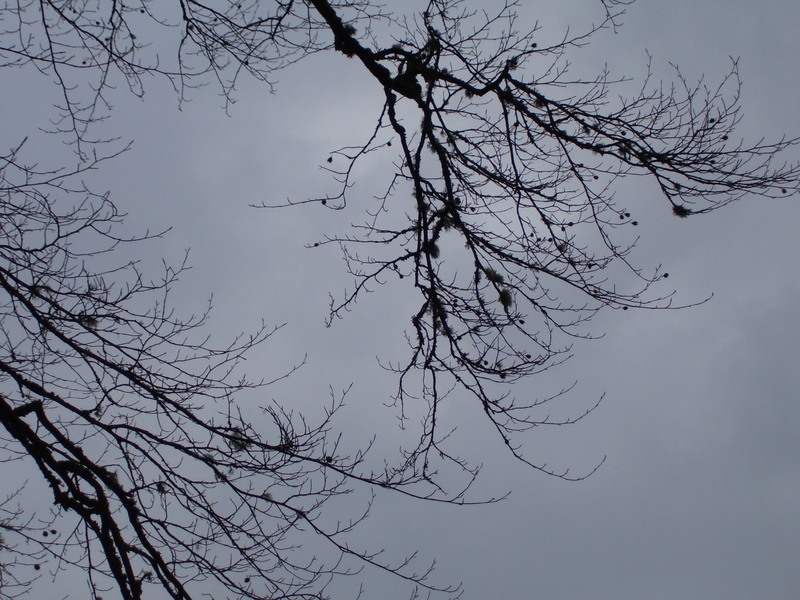 If I look long enough, I always see forms – usually human – in the branches of deciduous trees in the winter. I keep meaning to draw or paint what I see. Thanks for the reminder of how beautiful these trees are. Have you copper beeches there as well, by the way? There was a big, graceful one in my parents garden when I was growing up. We are lucky enough to have a few glorious, sweeping mature copper beeches in the woods, as well as an avenue of younger trees in which copper beeches alternate with ordinary ones. In another generation or two it will look amazing. My granny used to love drawing trees in winter. They are endlessly rewarding.